We are happy to say that our next two releases will be available to buy on vinyl! SEMA4026, a cut of beautiful D&B from Nephilim, will be followed up by SEMA4027, featuring two of the scene’s freshest up-and-coming producers with some brilliant liquid drum & bass. More information will follow shortly. Expect a forthcoming release later on in the year with a remix from label stalwart Hostile Product. 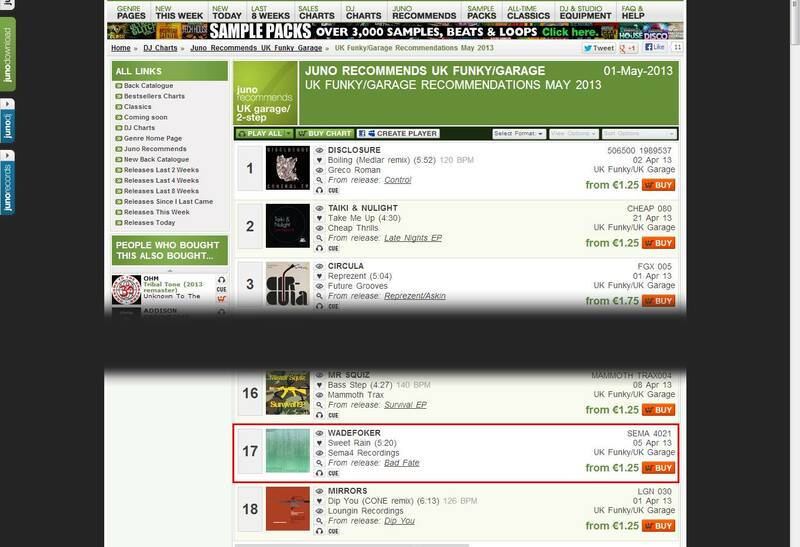 ‘Sweet Rain’, a wonderful piece of Garage by WadeFoker, (released on the Bad Fate EP) has made it onto Juno Download’s recommended chart for May 2013. Congratulations Vincent! Here at Sema4 we’re happy to announce the signing of Distanseè (aka Fungus), a brilliant producer from Molde, Norway. We’ll be releasing an EP of his Drum & Bass work later this year! Sema4 is proud to announce the signing of WadeFoker! Hailing from Lorraine, France, with tracks already signed to Wasted Records, he’s a master of the broken beat. Expect his first release on S4 out in early-mid 2013. Sema4 new signings put out some of the best stuff we’ve had to offer so far. Indica is a beautiful ambient driven piece while CyclesOf offers up some deep, deep, dubstep. Get it over at Chemical Records now! Vinyl copies will be on sale from Monday 4th June. Shock Tactix puts out his second bit on Sema4, a double sided D&B release sure to get you listening. Definitely worth checking out! Stocked by Juno and all good stores. Up rolls Thorpey’s second release on S4, Resistance/Deconstruction. Two hard-hitting Dubstep tracks sure to rumble your ‘drums. Get ’em now from Juno or all good stores. Thorpey’s first release on Sema4, Red Sky/Distant Place delivers a couple of great tunes all tied together for a very reasonably price. Certainly one to get bought right away! Available from Juno and all the usual webstores. Note: Cover art and EP title at Juno is incorrect. Our distributor has been notified. Darren F’s brilliant ‘Time EP’ is out today! Already being pushed by some of the best YouTube channels, this is sure to be a piece of classic liquid D&B. Buy it over at Beatport now!